Laborer’s Love (Laogong zhi aiqing) was a short film produced in China, also known as Romance of a Fruit Peddler (Zhi guo yuan). It constitutes the earliest complete film from China’s early cinematic history that survives today. The film was one of the earliest productions of the soon-to-be prolific Mingxing Film Company and was directed and written by Mingxing co-founders Zhang Shichuan and Zheng Zhengqiu, respectively. 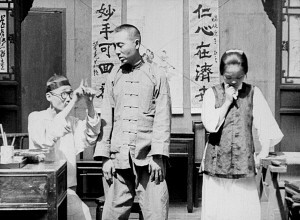 Notably, the film had both Chinese and English intertitles; a clear indication that at this early point in its history, cinema in Shanghai was made not only for the Chinese, but for the many Westerners residing there as well.